Earlier today WordPress found some malicious codes in several popular plugins, namely AddThis, WPtouch, and W3 Total Cache. These malicious codes may run as cleverly disguised backdoors on your blog, which is dangerous! 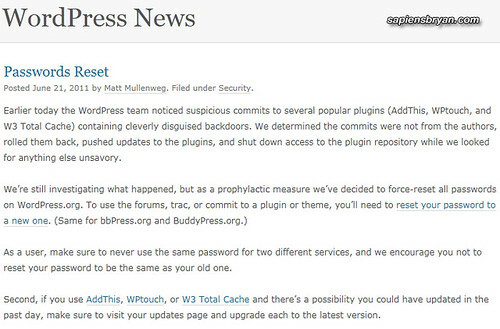 Therefore, WordPress urged all WP blog users who have these plugins installed or upgraded recently to reset your password immediately. Do not use the same password as the new password! 1. In the Admin Panel menu, go to Users. 2. Click on your username in the list to edit. 3. Scroll to the bottom to the New Password section and type in a new password in the two boxes provided. The strength box will show how good (strong) your password is. 4. Click the Update Profile. 1. Go to your WordPress Login page. 3. Enter your user name and the email address on file for that account. 4. The new password will be emailed to your email address. Meanwhile, all password at wordpress.org were forced-reset so you’ll need to request for the new password to be sent to you in case if you need to login to wordpress.org. I’m new to WordPress, so i’ll have a look at that !